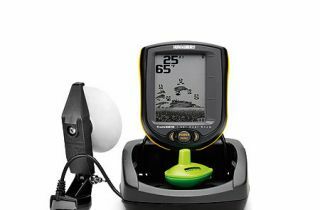 PiranhaMAX 230 Portable features traditional and wireless technology in one compact, portable unit to locate fish anywhere possible. Rugged portable case protects fishfinder while in storage or transport. Suction cup transducer mounts on most aluminum, wood and fiberglass hulls with smooth surface. SmartCast® Advanced Remote Sonar Sensor with 4 level grayscale sonar, water temperature and programmable light for night fishing. Traditional 20º sonar for depth to 600 feet. SmartCast 90º single beam wireless sonar with operating range to 100 feet and depth capability to 120 feet. 800 Watts peak to peak (100 Watts RMS) power output.